When San Francisco and Bay area homeowners are looking for top quality replacement windows, they know that they only need to look at Armstrong. We specially designed our vinyl replacement windows to meet our tough standards and recommendations of our customers. For over 50 Years, we have been committed to providing our customers with only the highest quality products. Our windows are manufactured with durable high-end components and are beautifully designed to suit virtually any style. Most importantly, Armstrong replacement windows are competitively priced and covered by one of the best warranties in America. Our replacement windows and doors also carry up to a limited lifetime manufacturer’s warranty. Our dedication to satisfying the needs of all our customers, including those who prefer the look of traditional wood, has lead us to team up with the experts at Marvin Windows and Doors to bring to San Francisco and the Bay area Infinity® from Marvin Replacement Windows exclusively by Armstrong. Infinity® from Marvin is the pinnacle of quality, strength and design. This extraordinary line of windows is manufactured with Ultrex Fiberglass which offers strength and durability like no other material can provide; allowing a focus on design rather than overbuilding the window to support its own weight. Fiberglass also expands and contracts at such a similar rate to the glass inside, that the chance for weather intrusion and window failure becomes virtually zero. These low-maintenance replacement windows with the appearance of a traditional wood are constructed with Ultrex Fiberglass – a material so tough, you’ll never have to worry about replacement windows again! All Infinity® from Marvin windows are energy-efficient, essentially maintenance free and available in multiple colors and Everwood® finishes. By selecting to replace your wooden windows with Infinity from Marvin replacement windows, you’ll never have to worry about painting or staining your windows again! These incredibly durable and attractive replacement windows are customizable to meet the needs of any replacement project. Ultrex fiberglass, which is used to construct the Infinity® from Marvin line, is a pultruded fiberglass material which is incredibly durable and able to outlast and outperform any other window material currently available. Marvin’s patented process uses strong cables of glass that are saturated with specially compounded resins. This material is then pulled through a heated die and cut with diamond-edge blades, creating an extremely durable material. Apart from being incredibly durable and extremely low maintenance, the low expansion characteristic of Ultrex Fiberglass means that your replacement windows will operate hassle-free for life and greatly reduces the risk of seal failures and air leakage through the window. Their superior window seal makes them highly energy-efficient; the inability of air to penetrate the seal means that your home is kept cool in summer and warm in winter. Since Ultrex is exceptionally strong, Infinity® from Marvin windows have narrower profiles than other types of windows, which results in more visible glass area and expanded views. In addition, the patented, mechanically bonded inline acrylic finish is up to 3 times thicker than competitive finishes. This makes the finish of Infinity® from Marvin replacement windows much more resistant to discoloring, scratching, and denting. Furthermore, many of our customers also choose these replacement windows because their frames are so well designed and crafted that they closely imitate the look and feel of traditional wooden window frames. In fact, it is difficult to distinguish the wood-look fiberglass options from real wood windows. Fortunately, though, when you install the Everwood® finishes, you will not have to worry about the typical maintenance you would have had to spend your precious time on if you had installed windows constructed with wooden frames! 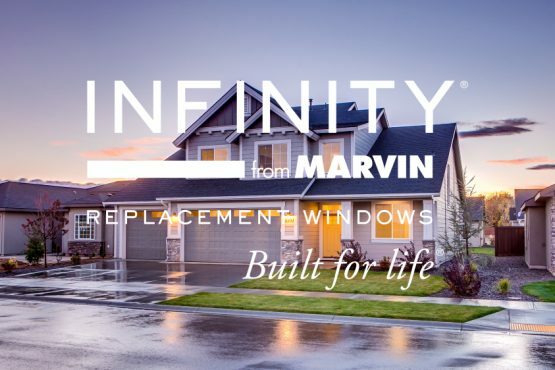 As an Infinity® from Marvin independent retailer for San Francisco and the Bay area, Armstrong was selected because of our over 50 years of expertise in replacement windows and our understanding of unique local codes, requirements, and installation needs. As an Infinity® from Marvin retailer, Armstrong can offer you a one-stop shopping experience. Our knowledgeable window replacement experts will guide you from our initial consultation all the way through the full-service delivery and professional installation and clean-up of the area. Armstrong has also chosen to offer its customers Infinity® from Marvin replacement windows because every Infinity® from Marvin product is backed by the Infinity Limited Lifetime Warranty. This means that the manufacturer will stand behind its products for as long as you own them. Contact us today for information about replacing your windows with Infinity® from Marvin Ultrex Fiberglass windows from the experts at Marvin Windows and Doors!